Metallicious, a red roan daughter of Metallic Cat shown by T.J. Good, scored 222 points on Wednesday, to claim the first of six days of NCHA Futurity Open first go-round competition. Sugarush, ridden by Greg Wright, and Catillac Reys, with Ascencion Banuelos, tied with 219.5 points, the day’s second-highest score, while Brandon Dufurrena and Cherry Chapstick marked 219 points. At the end of the day, 31 of the 86 entries had scored 215 points or higher. Owned by Charles Burger, Chatsworth, Ga., Metallicious was purchased at the 2015 NCHA Futurity Sales for $35,000 from her breeders Alvin and Becky Fults, who have two of Metallicious’s yearling full siblings consigned to this year’s sale. Out of Sweet Shorty Lena LTE $110,484, Metallicious is half-sister to Spots Hot LTE $502,682, a leading sire of 2017 money earners. 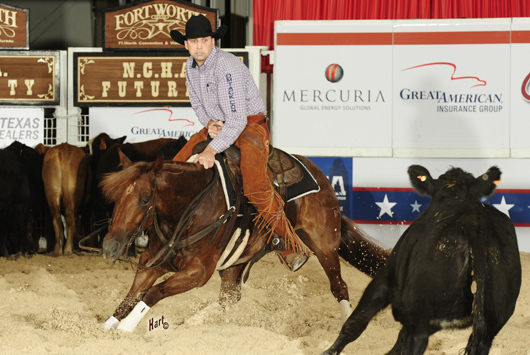 T.J. Good, the NCHA earner of $1,103,554, was reserve champion of the 2013 NCHA Futurity riding Stunned LTE $111,797, by High Brow Cat. Most recently, he won the 2017 Arbuckle Mountain Open Derby aboard Game On Smooth LTE $59,433, by Smooth As A Cat.